When it comes to entertaining her family during the summer months, Amy Popich knows exactly what her sons like to do — and what they’re capable of. Despite living in a 21st-century world in which kids update their Facebook statuses from their cell phones and watch their favorite cartoons on their iPads, Popich has found ways to share a love of the outdoors with her family in their own backyard. And with a recent study examining the amount of time that children spend playing outside, Popich is doing exactly what the doctor ordered. Spending time outdoors encourages kids to be more physically active, which helps prevent obesity both in childhood and throughout the adult years, says pediatrician Dr. Pooja S. Tandon of Seattle Children’s Research Institute. According to a recent study that Tandon led (published in the Archives of Pediatric & Adolescent Medicine), nearly half of all preschoolers are not provided with even one parent-supervised outdoor play opportunity each day. When the summer sun breaks through the gray skies, playing in the backyard can help parents create meaningful connections with their children. Turning off the television, slathering on sunscreen, and playing outside is a little retro and deliciously nostalgic. 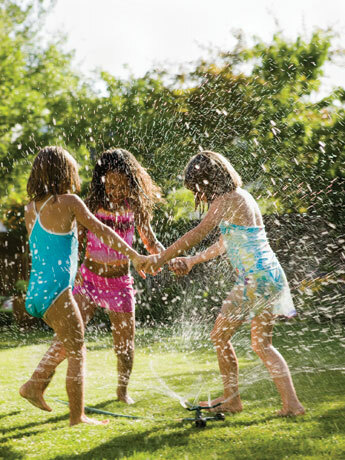 Here are some ways to help your kids have some good, old-fashioned summer fun in your own backyard. What kid (or adult, for that matter) doesn’t love the gravity-defying sensation that comes from swinging? Make dreams of flying come true by constructing a play set in your backyard. If you can afford it, your kids are sure to love a home playground such as those offered by Rainbow Play Systems. But even a simple DIY swing made from some heavy rope and a flat board can provide hours of fun. Promote your child to archaeologist, marine biologist or city maintenance manager—whatever suits his fancy—and give him a job in the sandbox. If he likes trucks, a toy dump truck is perfect for scooping up the sand. If you just returned from a trip to the beach, include some shells collected on your adventure. When it comes to fun in the sun, there’s nothing like splashing in the water. Set up your sprinkler, dig the plastic wading pool out of storage, and create a water table with a plastic bin, a watering can, and an assortment of funnels and measuring cups. It probably goes without saying, but be sure to supervise kids whenever they’re around any body of water. “There are many tried-and-true children’s games that remain relevant in our super-technological worlds,” says Evi Feltus, certified child life specialist at Swedish Medical Center. From hide and seek, tag and scavenger hunts to lawn and net games, a little friendly competition will entertain kids for hours. 5. AS AMERICAN AS MUD PIE? Play kitchens can cost hundreds of dollars, and if you can spring for it, then go right ahead! Or construct a DIY version for less than $20 with some simple and easy-to-find items. Cut an oven door into the front of a sturdy moving box and use a marker to draw burners and knobs. Collect thrift-store cookware, and your kids will be set. There’s nothing like a good playhouse to inspire creativity and imaginative play in the younger set. The Internet is full of DIY ideas, or you can buy one to fit your needs from a company such as Olympia-based Millworks Custom Sheds. Why stop at a house? Build a city! Whether it will be an old Western frontier town or the scaled-down skyline of Seattle, start collecting cardboard boxes now and by summer, your kids will be able to create the best cardboard city in town. While you’re busy planning your backyard fun, remember that kids need little prompting when it comes to imagination. But if you want to give them a launching point, give them a basket with a few simple items and see where it takes them. A spool of yarn wound around chairs and trees creates a challenging obstacle course. The basket, when turned upside down, is a drum—and all it takes is a little imagination before your kids have repurposed some branches for drumsticks and formed a band with their friends. The sky is the limit when it comes to outdoor art. Sidewalk chalk is the perfect medium for a pavement canvas, while pinecones and leaves make interesting textures when used in place of a paintbrush. Pressing leaves and flowers creates lasting memories of summer days. Create an urban oasis by moving the indoors to your backyard. With a patio umbrella to provide shade and plenty of ice water to keep everyone hydrated, you’ll feel like you just increased the square footage of your home. When the sun sets, there’s no need to move indoors quite yet. Pitch a tent or gather around the fire after twilight. In an informal survey of Seattle-area parents, gardening won out as the most common summer backyard activity. Whether you have a large space for kids to create their own garden or simply have a little patch adjacent to your neighbors’, you can teach children about plants and where food comes from by helping them learn a little about gardening. If you are a true novice, make this a year about learning. Start with a small garden bed (2 by 4 feet) or a couple of large containers. Take a few classes with your kids or send them to camp and have them teach you. Buy a copy of our book Your Farm in the City and keep it close by for handy reference. Where you put your garden can make the difference between success and failure (or neglect). Find a sunny spot close to where you already spend time when you’re outside, with water nearby. Select crops that your family likes to eat and that grow easily in our climate, such as lettuce, arugula, kale, snow peas and pole beans. Make a ritual out of tending the plants. Nibble on the tender leaves and shoots. 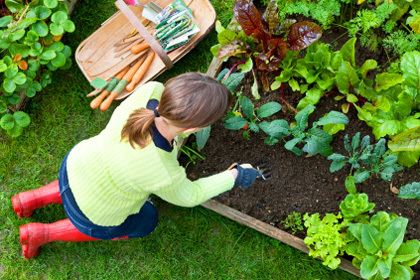 Involve your child in the garden by following their interests. Make work fun, change activities frequently and be flexible. Explore the creature world by making a worm bin and by building bug houses and snail habitats. Find sturdy, kid-sized tools. Create tunnels and tepees to grow vines on that also act as secret hideouts and forts.